Ένα υπέροχο τραγούδι της δεκαετίας του '70 θα σας θυμίσω σήμερα. 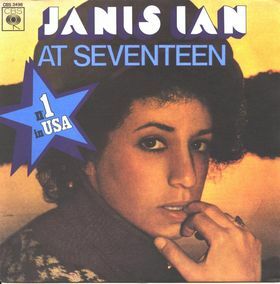 Το "At Seventeen" είναι ένα τραγούδι της Janis Ian που κυκλοφόρησε το 1975 στο άλμπουμ Between the Lines (το έβδομο της). Αποτελεί τη μεγαλύτερη επιτυχία της τραγουδίστριας. Ενδιαφέρουν παρουσιάζουν οι στίχοι του τραγουδιού καθώς η Janis τους έγραψε όταν ήταν 22 χρονών και τους εμπνεύστηκε από ένα άρθρο εφημερίδας που αναφερόταν σε μια πανέμορφη κοπέλα που ανακαλύπτει κάποια στιγμή ότι δεν αρκεί η ομορφιά και μόνον αυτή. I learned the truth at seventeen,That love was meant for beauty queens.In high school, girls with clear-skin smiles,Who married young and then retired. The valentines I never knew.The Friday night charades of youth,Were spent on one more beautiful.At seventeen I learned the truth. And those of us with ravaged faces,Lacking in the social graces,Desperately remained at home,Inventing lovers on the phone.Who called to say come dance with me.And murmured vague obscenities.It isn't all it seems,At seventeen. A brown-eyed girl in hand-me-downs.Whose name I never could pronounce,Said, "Pity, please, the ones who serve,They only get what they deserve." And the rich-relationed, hometown queen,Marries into what she needs.With a guarantee of company,And haven for the elderly. Remember those who win the game,Lose the love they sought to gain.In debentures3 of quality,And dubious integrity.The small-town eyes will gape at you,In dull surprise, when payment due,Exceeds accounts received.At seventeen. To those of us who knew the pain,Of valentines that never came.And those whose names were never called,When choosing sides for basketball. It was long ago and far away,The world was younger than today.And dreams were all they gave for free,To ugly-duckling girls like me. We all play the game and when we dare,To cheat ourselves at solitaire.Inventing lovers on the phone,Repenting other lives unknown,That call and say, come dance with me,An' murmur vague obscenities,At ugly girls like me,At seventeen. Αναρτήθηκε από lsim στις 12:57 μ.μ.